Bernardo Strozzi, better known by the names of Cappucino Genovese and il Prete Genovese, which he received in consequence of his belonging to the order of Capuchins, was born at Genoa in the year 1581. He was the pupil of the Sienese master Sorri... The picture of Esther interceding with Ahasuerus ( Xerxes in the Bible ) for her people presents a favourable specimen of the powers of this master. 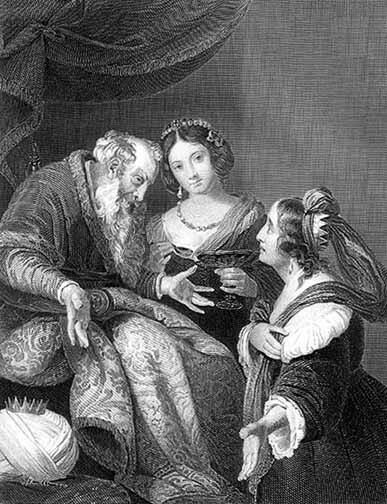 The King granted the request of his fair petitioner before it was made, the moment chosen by the artist seems to be that immediately previous to her entering on the subject as she appears to be gazing on the venerable countenance of the aged Monarch, with an air of anxious uncertainty. 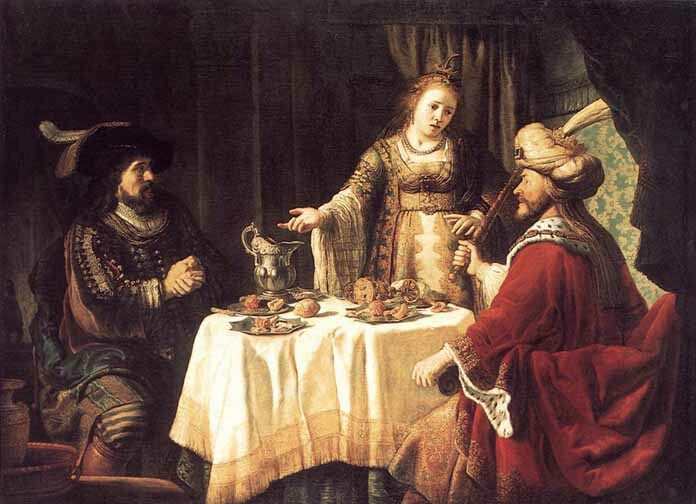 Also see The Banquet of Esther and Ahasuerus by Jan Victors (1640s), who painted mostly Old Testament scenes. He apparently made them primarily for Calvinist patrons. His large pictures of Old Testament subjects are distinctly related to Rembrandt's biblical pictures done after the mid-thirties; his paintings of tradesmen and rural genre scenes are more personal. In this scene the Jewish heroine Esther, wife of the Persian King Ahasuerus, notifies her husband of the plans of his advisor Haman, here seen at left, who has schemed to massacre the Jews in the Persian empire. * Gifts will only be sent to an address in the U.S. A person who wins a gift during this month, cannot win another gift until the following month. Gifs selected by eworldrecords.com will be delivered in 7-12 days. Your quiz questions and answers will be considered for this section. Please email them here. This page will be updated with a new question as soon as the answer to the current quiz is received. If no correct answer is received within a week, the answer will be provided by iranian.com.